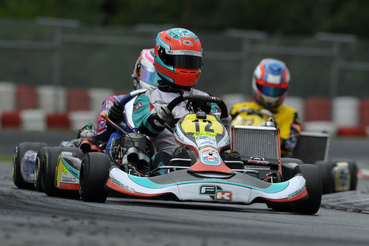 Mainly regrouping professional Karting Drivers directly entered by the Manufacturers, the top category of gearbox karts promises to offer breathtaking spectacle during the KZ1 European Championship. According to the specialists, there are approximately ten of them – at least! – who can claim victory at the finish of the decisive Final. Although the reigning European KZ1 Champion Paolo De Conto changed Teams this winter (he will henceforth represent the Birel factory), he is nonetheless determined to keep his number 1. He will however have to face the strongest opposition with several Drivers boasting first-class lists of results. Former European Champions and winners of the World Cup for KZ1, the Dutchman Bas Lammers (Praga-Parilla) and Belgium’s Jonathan Thonon (CRG-Maxter) are among those ones, just like the former World Champions Marco Ardigo (Tony Kart-Vortex), Davide Foré (CRG-Maxter), Arnaud Kozlinski (PCR-TM) and Alessandro Piccini (Tony Kart-Vortex), still as motivated despite his 47 years of age. Against these Karting stars, the list of challengers still in search of a maiden major title in the category is quite attractive with the Belgians Yannick de Brabander (FK-TM, vice-Champion in 2011) and Rick Dreezen (Tony Kart-Vortex), the Briton Ben Hanley (ART GP-TM), as well as France’s Anthony Abbasse (Sodi-Maxter), Jérémy Iglésias (Intrepid-TM) and Armand Convers (Kosmic-Vortex), who was on the podium last year. Last but not least, the young Dutchman Jorrit Pex (CRG-TM) and two Drivers from KZ2: the Italian Fabian Federer, European Champion in the 2nd division of gearbox karts last year, and Holland’s Joey Hanssen, winner of the World Cup for KZ2.